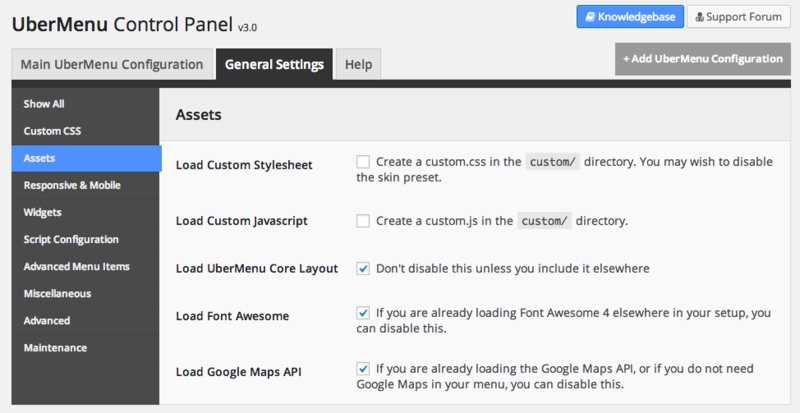 UberMenu’s settings are located in the UberMenu Control Panel. These settings control the properties of your menus as a whole, while the Menu Item Settings control the properties of individual menu items. The UberMenu Control Panel is broken into several tabs across the top of the page. Note that each tab is independent, so you must save your settings from one tab before making changes in the next tab. The Main UberMenu Configuration tab controls settings specific to the main menu that is created automatically with UberMenu (you can create additional configurations as well). This is where you configure settings like the menu skin, orientation, position, etc – anything that pertains to the menu as a whole, rather than an individual menu item. 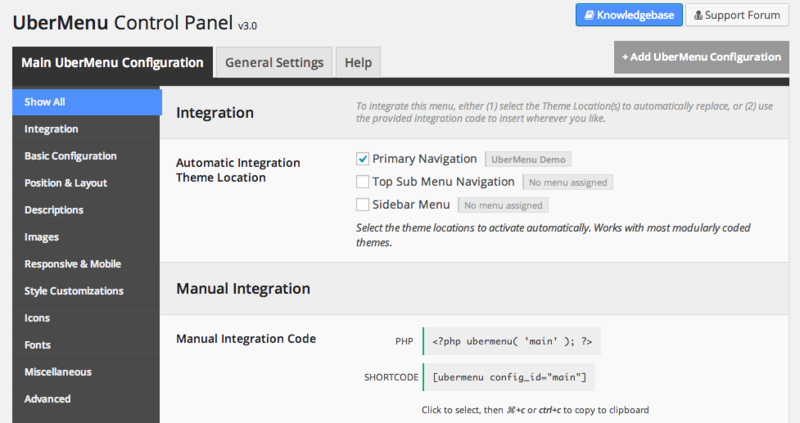 It is also where you can integrate your menu and generate menu code which you can add to your site. The General Settings tab controls settings that are global, and not just for a specific menu. This is where you configure settings like whether certain assets are loaded, add CSS which will be applied site-wide, configure script settings and the responsive breakpoint. It is also where maintenance tasks like migration and resetting settings are housed. The Help tab gives you access to the UberMenu support resources, like a Knowledgebase search, video tutorials, and the Support Forum. Note that there are also quick links in the upper right of the Control Panel to these resources.